TSPSC Gurkulam TGT (Mathematics, Biological Science & Social Studies) Results, Selection List Certificate Verification dates, venues announced. 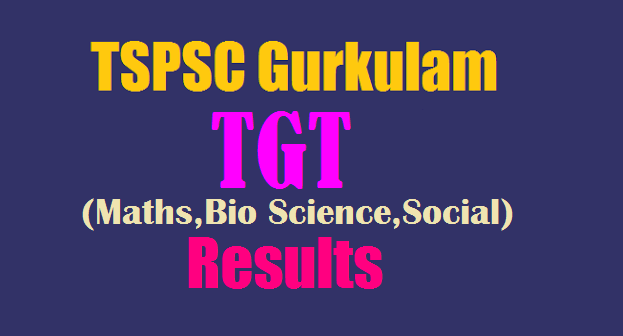 TSPSC Gurkulam TGT subject wise Results, Certificate Verification , Selection List @ tspsc.gov.in: Telangana State Public Service Commission :: Hyderabad Trained Graduate Teachers results announced: It is hereby notified that on the basis of Main Examination for the Post of TGT (Maths,Bio Science,Social) in various Residential Educational Institutions Societies, 3323 candidates with the following Hall Ticket Numbers are provisionally picked up in the ratio of 1:2 for Certificate Verification against total number of 1685 vacancies. The Certificate Verification is scheduled to be held from 04/12/2017 to 08/12/2017 at Sankethika Vidya Bhavan, Masab Tank, Hyderabad beside Govt., Polytechnic College from 9.30 AM onwards... Provisional List of eligible candidates picked up for Certificate Verification for the Post of TGT (Mathematics, Social Studies &Biological Sciences) in various Residential Educational Institutions Societies vide Notification No.14/2017 (General Recruitment) download from here. ➧TGT (14/2017) - SUBJECTS: BIOLOGICAL SCIENCE, MATHEMATICS & SOCIAL STUDIES - RESULTS FOR VERIFICATION OF CERTIFICATES.